PrintedPlayingCards.com ("we" or "us") maintains this web site (the "Site") as a service to our customers and other interested parties. Please visit our Site frequently, subject to the terms and conditions set out below. We may alter, suspend, or discontinue this Site in whole or in part, at any time and for any reason, without notice or cost. The Site may periodically become unavailable due to maintenance or malfunction of computer equipment or for other reasons. No part of this Site may be reproduced, published, distributed, displayed, performed, exhibited, modified, or exploited in any way, in whole or in part, except that we authorize you for personal, non-commercial use only to view, copy, download, and print posted documents solely for the purpose of purchasing products from PrintedPlayingCards.com. Nothing contained on this Site should be construed as granting any license or right to use this Site or any documents displayed on this Site. When you use this Site, you consent to keep your password private. The protection of your username and password is your responsibility. When you visit this Site or e-mail us, you are communicating electronically. We will email you or put notices on this Site to communicate with you. By e-mailing us or submitting an order through this Site, you consent to the receipt of electronic communications from us. Unless stated otherwise, all text, images, content, information, and/or other intellectual property contained on this Site are copyrighted, trademarked, owned, controlled and/or licensed by PrintedPlayingCards.com, its affiliates, or by third parties who have licensed their materials to PrintedPlayingCards.com, and all such materials are protected by U.S. and international copyright laws, and are protected from unauthorized copying and dissemination by United States copyright law, trademark law, international conventions and other intellectual property laws. By way of example only, and not as a limitation, "PrintedPlayingCards" is a trademark of PrintedPlayingCards.com, and the content of the Site is subject to copyright owned by PrintedPlayingCards.com. Any other product names are trademarks or registered trademarks of their respective owners. PrintedPlayingCards.com and its licensors and suppliers expressly reserve all intellectual property rights in all text, programs, products, processes, technology, content and other materials on this Site at any time. No one is given any rights relating to any intellectual property of or to any license to PrintedPlayingCards.com or to any third party's intellectual property rights by using this Site. 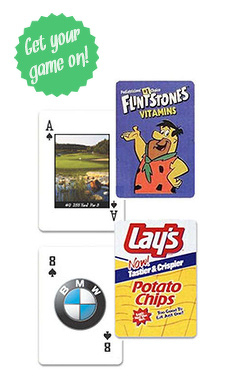 Our graphics, logos, page headers, button icons, scripts, service names, design marks, slogans and other components of our Site and related materials are trademarks or trade dress of PrintedPlayingCards.com and its affiliates. PrintedPlayingCards.com's trademarks or trade dress may not be used in connection with any product or service that is not PrintedPlayingCards.com's, in any manner that is likely to cause confusion among customers, vendors, shoppers, or any other party, or in any manner that disparages or discredits PrintedPlayingCards.com. All other trade, dress, or product marks appearing from time to time on this Site with respect to the products being offered for sale are the property of their respective owners. A limited license to visit and use this Site for non-commercial use is granted to you by PrintedPlayingCards.com. The materials on this Site, including, without limitation, images, text, illustrations, designs, icons, photographs, programs, and written and other materials that are part of this Site are intended to be used only as an aid to shopping on this Site and may not be used by you for any other purpose. You may not collect listings of products, prices, descriptions, use any portion of the content in any derivative way, download, or copy information or other matter for your own commercial use or the commercial use of any other party. You may not gather information and data from mining, robots or other extraction tools. Neither this Site nor any part of it can be copied in any way or used commercially without express written permission from PrintedPlayingCards.com. The permission or license granted to you by PrintedPlayingCards.com to use this Site shall terminate automatically upon any unauthorized use by you. The information on this Site is believed to be complete and reliable; however, the information may contain typographical errors, pricing errors, and other errors or inaccuracies. Errors will be corrected as soon as practicable. Nothing on this Site constitutes an offer to contract, rather all products, prices, and other representations are invitations to deal. We reserve the right to: (i) revoke any stated price, product, content, or deal; (ii) correct any errors, inaccuracies or omissions; and (iii) change prices, content, promotion offers, product descriptions or specifications, or other information without obligation to issue any notice of such changes (including after an order has been submitted, acknowledged, shipped or received). If you purchase a product which is not as described on the Site, described, your sole remedy is to return it in unused condition for a replacement, discount, refund or credit. PrintedPlayingCards.com does not claim ownership of any materials you make available through the Site. With respect to such materials you submit or make available for inclusion on the Site, you grant PrintedPlayingCards.com a perpetual, irrevocable, non-terminable, worldwide, royalty-free and non-exclusive license to use, copy, distribute, publicly display, modify, create derivative works, and sublicense such materials or any part of such materials. You hereby represent and warrant that any materials you provide do not infringe any existing third-party copyright, trademark, patent, or trade secret. You further represent and warrant that all materials submitted by you do not include any object, concept, idea, invention, or expression to which you do not have the right to distribute, share, gift, or license, as appropriate.. It is prohibited to violate or attempt to violate the security of this Site in any manner, including, without limitation; (a) obtaining or attempting to obtain data that is not intended for you; (b) gaining unauthorized access to an account; (c) attempting to breach security without permission; (d) testing the vulnerability of this Site; (e) attempting to interfere with this Site, including the host, network, or user, in any manner; (f) sending emails that were not solicited, including ads and promotions; or (e) forging a TCP/IP packet header or any part of header information. These violations could result in civil or criminal penalties. PrintedPlayingCards.com will investigate violations and will work with legal authorities to prosecute violators to the fullest extent of the law. You will not be charged until PrintedPlayingCards. We reserve the right to decline your order at our sole discretion. Some of the reasons we may decline the order are (a) if the goods are unavailable, (b) if pricing is in error, or (c) if there are problems concerning credit or fraud. We will contact you if we decide to decline your order or if we need more information. If we decline your order, we will credit your credit card for any amount charged with respect to such order. Suggestions, ideas, comments, questions, or other information may be submitted to us, but any illegal, obscene, threatening or defamatory content and any content that is invasive of privacy, infringing of intellectual property rights, or otherwise injurious is strictly prohibited. PrintedPlayingCards.com actively reports and prosecutes actual and suspected credit card fraud. We may require further authorization from you such as a telephone confirmation of your order and/or other information. Our decision to require further authorization is at our sole discretion. PrintedPlayingCards.com reserves the right to cancel, delay, refuse to ship, or recall from the shipper any order if fraud is suspected. ALL TEXT, IMAGES, AND OTHER INFORMATION ON OR ACCESSIBLE FROM THIS SITE ARE PROVIDED ON AN "AS AVAILABLE" AND "AS IS" BASIS WITHOUT WARRANTY OF ANY KIND, EITHER EXPRESS OR IMPLIED, INCLUDING BUT NOT LIMITED TO THE IMPLIED WARRANTIES OF MERCHANTABILITY, FITNESS FOR A PARTICULAR PURPOSE, OR NON-INFRINGEMENT. SPECIFICALLY, BUT WITHOUT LIMITATION, PrintedPlayingCards.COM DOES NOT WARRANT THAT: (i) THE INFORMATION AVAILABLE ON THIS SITE IS FREE OF ERRORS; (ii) THE FUNCTIONS CONTAINED ON THIS SITE WILL BE UNINTERRUPTED OR FREE OF ERRORS; (iii) DEFECTS WILL BE CORRECTED, OR (iv) THIS SITE OR THE SERVER(S) THAT MAKES IT AVAILABLE ARE FREE OF VIRUSES OR OTHER HARMFUL COMPONENTS. IN NO EVENT SHALL PrintedPlayingCards.COM OR ITS OFFICERS, DIRECTORS, EMPLOYEES, AGENTS, SUCCESSORS, SUBSIDIARIES, DISTRIBUTORS, AFFILIATES OR THIRD PARTIES PROVIDING INFORMATION ON THIS SITE BE LIABLE TO ANY USER OF THE PrintedPlayingCards.COM WEB SITE OR ANY OTHER PERSON OR ENTITY FOR ANY DIRECT, INDIRECT, SPECIAL, INCIDENTAL, PUNITIVE, CONSEQUENTIAL OR EXEMPLARY DAMAGES (INCLUDING, BUT NOT LIMITED TO, DAMAGES FOR LOSS OF PROFITS, LOSS OF DATA OR LOSS OF USE) ARISING OUT OF THE USE OR INABILITY TO USE THE [ ].COM WEB SITE OR ANY INFORMATION CONTAINED THEREON, WHETHER BASED UPON WARRANTY, CONTRACT, TORT, OR OTHERWISE, AND WHETHER UNDER THEORIES OF CONTRACT, NEGLIGENCE, OR STRICT LIABILITY. This Site may contain links to non-PrintedPlayingCards.com web sites. These links are provided to you as a convenience, and you access them at your own risk. We are not responsible for the content of any linked web site or any bulletin board associated with us. Any outside web site accessed from our Site is independent from PrintedPlayingCards.com, and we have no control over the content of such web sites. In no event shall any reference to any third party or third party product or service be construed as an approval or endorsement by us of that third party or of any product or service provided by a third party. Likewise, a link to any non-PrintedPlayingCards.com web site does not imply that we endorse or accept any responsibility for the content or use of such a web site. We reserve the right to make changes to the Site and our policies and promotions at any time.